FocusRent, car rental company which operates in Bucharest and Otopeni, offers you the best deal for a minibus rental: Mercedes Vito, starting from 45 euro/day, with all the taxes included! In addition, through our car rental services, you benefit from many other advantages: tank full of gas, RCA and full CASCO insurance included, and no limit of kilometers. Available through our 8+1 minibus rental services, Mercedes Vito has a loading capacity of 1369 kg, making it an ideal choice for vacation trips, especially if you have a numerous family. Mercedes Vito is an elegant minibus, its quality and refinement being reflected in its beautifully designed exterior, as well as in its interior, with its luxury customizable seats. Safety is of most importance for our customers, therefore, Mercedes Vito comes with a number of efficient safety features: automatic system for maintaining focus, automatic system for monitoring the pressure in the tires, airbags for the driver and the front passenger. 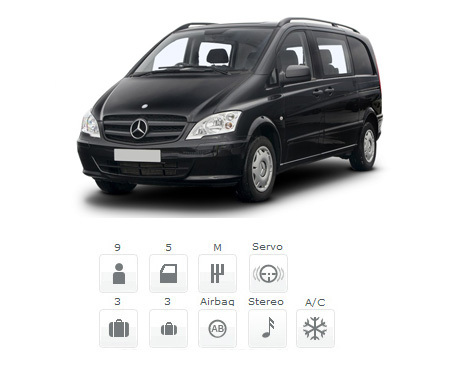 Choose Mercedes Vito for your vacation and we offer you fast and free delivery in Bucharest, as well as free replacement of the minibus, in case of damage, in no longer than 5 hours.